Luxurious Loveable Lemony Looks.... and fragrant to boot!!! 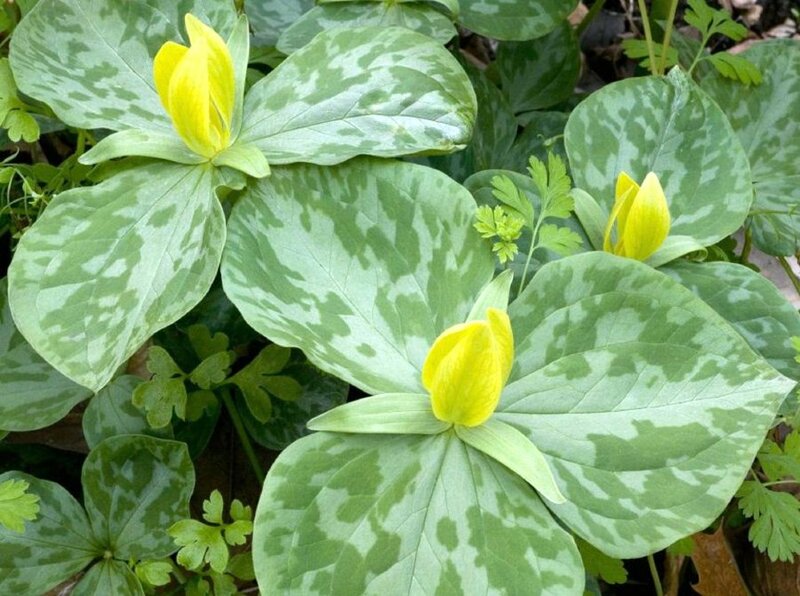 With their bright yellow flowers in early to mid Spring and silvery marbled foliage, Trillium luteum is one plant whose fragrance matches its exotic looks. Their aroma can only be described as a lemony, jasmine scent that creates an intoxicating, fragrant cloud which lasts for quite a while as the flowers are very long lived. You don't even have to get down on your hands and knees to imbibe them, as even on a still day, the air is filled with its presence. One would think that a plant with such an extraordinary appearance, would be difficult and demanding, but quite the contrary. Trillium luteum is an extremely easy plant to grow in virtually any garden. All you need is "Woodland Conditions", so let me describe that term for you. It's simple to understand - full to bright shade is one aspect and average to well drained soil is another. I wish I could report that this charming plant is 100&perc; deerproof, but that would be an untruth. Fact is, it doesn't seem to be at the top of Bambi's wish list like Trillium grandiflorum is, but they do sometimes nibble at them. So if your garden isn't fenced from a pack of ravenous venison, you can resort to one of the many effective deer repellents that are on the market. Depending on soil conditions, this species can reach heights of over 18". The ones in my garden are about 12" - 15" tall, some with leaves over 4" long. Trillium luteum is native to most of the Southeastern US, MI and ON in Canada. It's hardiness has never been in question and they haven't even batted an eye at -20F here. As far as heat tolerance goes, I would say that it can handle anything short of Death Valley CA, given full shade in the deep South or any other areas that climb into the triple digits. Good companion plants are just about any species of Ferns, Hostas (if you don't have a deer problem) and any other shade loving plant. The flowering size and age plants I'm offering you here are 8-10 years old and have been propagated from rhizome division, a very easy method of increasing your Trillium populations, as seed propagated Trillium can take 7 years to produce a flowering size plant. I have just over 500 of my 8-10 year old flowering size Trillium luteum to share with you. I'll carefully wrap them for their journey to your garden in long fibered, unmilled sphagnum moss. This material is antibacterial, antifungal, antiviral and a very useful material to recycle. Shipping is FREE in a padded, bubble wrap envelope via First Class Mail, but.......adding $4.95 to your order will cover the cost of Insured Priority Mail and you'll have them 2 days after I receive your check. In order to be fair, I can't sell more than 10 to any one person. I'll have another crop ready to go next year and hope to keep the pipeline full, so don't fret if you miss out this year.